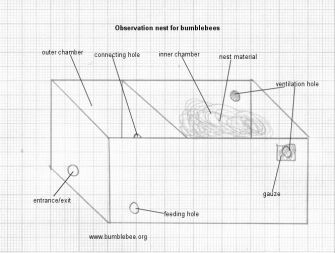 On this page I've drawn some plans for making inexpensive bumblebee nest boxes. The plans and designs are very simple, and can easily be adapted to suit whatever materials you have (coffee cans with plastic tops are a very good alternative, as is an old teapot). The most important thing to remember is that a nest searching queen is looking for a safe, dry cavity that has enough nesting material. Her nest site of choice is an old mouse/vole nest, or a bird's nest. So this is what you are trying to replicate. Please refer to the nestbox page for information about where to site the box as this is very important. If your box is sited in or near a good source of nectar and pollen for the whole nesting season, and is dry and safe, then you have done all that can be done. 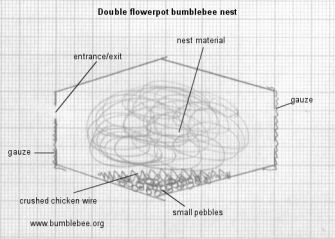 This is the simplest nest to make. I've drawn it on the same level as the soil, but it could be in the soil with just the entrance a little above soil level; partially in the soil, or even located higher up if a base is provided. 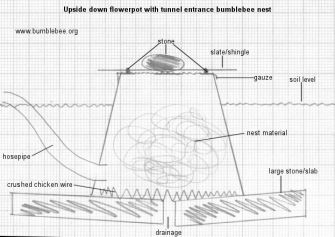 So this design is suitable for all species of bumblebee. The size of flowerpot used will determine the species that can use it. I would advise a 10 cm diameter as the smallest size. This will do for Bombus pratorum, B. hortorum and similar species. For Bombus terrestris I would recommend a 20cm diameter pot. The colour and material the pot is made of are not important, but probably a plastic pot is easier if you have to enlarge the entrance hole. The entrance hole can be from 1.5 - 2.5 cm in diameter, but if you are aiming for B. pratorum, I would go for a 1.5 cm entrance hole. The big stone on the top is just to stop the cover blowing off or being knocked off. The little stones should be large enough to allow the bumblebee to crawl under with ease. The slate/shingle can be any waterproof material. The crushed chicken wire is there to keep the nest dry and to allow any debris to fall out of the nest. You don't have to use chicken wire, any similar material will do. 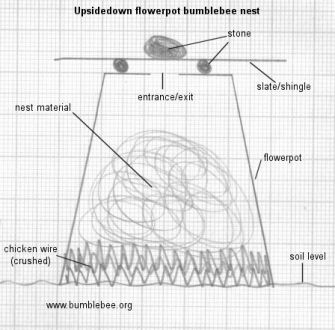 What you are trying to create is a pad to separate the nest from the soil to prevent wetness coming up and to ease any wetness going down. The nesting material is very important. The very best is the entire contents of a mouse or vole nest complete with droppings, however this is not always readily to hand. Alternatives are upholsters padding or wadding - the stuffing from an old chair is ideal as long as the material is natural, synthetic stuff tends to get tangled in the legs of the adults. Dried moss that has been chopped into small pieces is also good as is finely chopped and dried grass. Kapok is also OK. The nesting material should be formed into a ball and it is a good idea to make a little depression in it with your thumb for the queen to settle into. Many of the materials for this nestbox are the same as the one above. As with the one above this nest box could be located above, partially in or almost entirely in the ground. For the sizes of flowerpot, see the nest above. For this nest a plastic flowerpot is best as a hole has to be cut into the side. The small stones between the slate and the gauze are there only to provide a space for ventilation, so can be smaller than those in the top nest. The gauze is there to prevent entry of any predators, and may not be necessary if your flowerpot has very small drainage holes. For nest material and chicken wire, see the nest above. The hosepipe should fit snugly into the flowerpot hole. The length of pipe used does not matter, but it should be 20 cm or more for for a small flowerpot. The hosepipe can be used to fool a below ground nesting queen into thinking the nest is underground when it is not. Where the hosepipe comes to the surface clear away foliage and clip the grass short to make the entrance visible to nest searching queens. If you have access to mouse/vole droppings a few scattered in this area can also help attract queens. The large stones or slabs of concrete are there to provide drainage, and can be of any number. This is best made with plastic pots. If the nest is located fairly deep in the ground it is not necessary to fix the pots together as the soil will hold them in position, otherwise they have to be pinned, tied or somehow fixed together. I do not recommend using glue as the smell can repel queens. For info. on the nesting material, chicken wire and gauze see the nests above. The small pebbles are there to aid drainage. The entrance to this box can be located nearer the bottom if you wish, and a hose pipe could even be attached if you want to locate the nest underground, or to simulate an underground nest. This nest is best made of wood. The size depends on the species of bumblebee you have in your garden, and will range from a shoe box down to a kilo packet of sugar. I have not drawn the lid. This should be of plexiglas or similar and in two parts so that the outer chamber can be cleaned. This can be covered with more wood, or heavy material to keep out the light. For information on the nesting material, gauze and hole sizes see the nests above. It is a good idea to line the outer chamber with corrugated cardboard as it will get messy, and this can be replaced. The entrance can have a hosepipe attached to replicate underground conditions. The feeding hole should be made the size of the pipette/syringe/dropper you are using to supply nectar substitute, and should lead to a container. This container should be small enough so that the bees cannot fall into it. Or you can use a larger container covered with a gauze wide enough to allow the bumblebee tongue to penetrate.